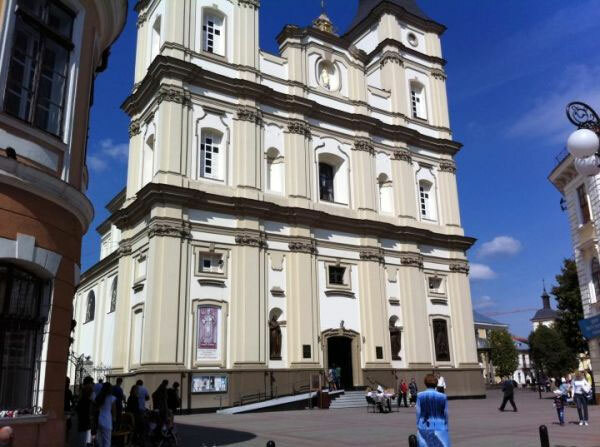 The construction of the original Roman-Catholic Cathedral in Ivano-Frankivsk started in 1720 and finished in 1729. The first divine service was held there at that time. Some technical mistakes had been made during the construction. It caused the appearance of cracks on the building, which threatened the parishioners. That is why the church was demolished in 1752 and a new building was constructed in 1763. The Roman- Catholic church was created by the representatives of the Austro-Bavarian Baroque School. It is remarkable for an accurate composition of its size, proportionality, regular order and moderation in wall decorating (architect Pototskyi and H. Dalke). Globular domes of the two towers, which have features of Hutsul wooden architecture, supplement well-proportioned silhouette of the main facade. Its shape resembles a brick eight-column basilica with a setback and facade. After the activity of the monks had been stopped by the Austrians in 1774 the church was used by the gymnasium students and the Greek-Catholic community in turns. At the request of the Ukrainians the Austrian government transferred the church to them in 1849. 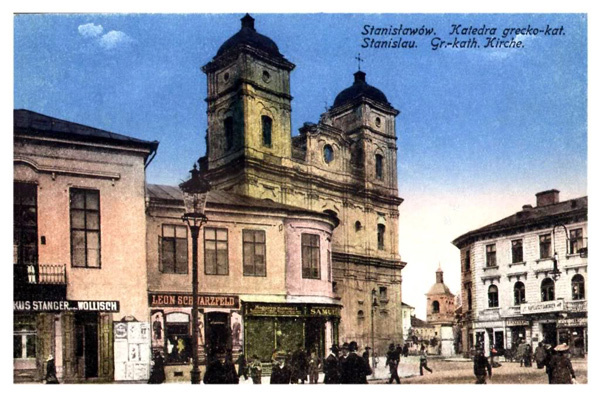 When the Stanislaviv Greek-Catholic diocese was formed according to the Pope’s bull, the church became the Cathedral. At the beginning of the 20th century a highly artistic Icon was fixed in the temple. It was created by the Ukrainian artists A. Monastyrskyi (1878 – 1969) and M. Sosenko (1875 – 1920). A Baroque sculpture of the main altar complements great decor of the interior. Andrey Sheptytsky was a Stanislaviv bishop in 1899 – 1900. As a result of the abolition of the Greek-Catholic church the temple was Orthodox during 1946 – 1989. After the revival of the UGCC (the Ukrainian Greek-Catholic Church) the temple got back its previous status of the Cathedral of Christ’s Resurrection. A high relief of Andrey Sheptytsky was fixed on its facade in 1993. In 1997 the sculptures of princess Olha and Volodymyr Velykyi as high priests of Kyiv Rus were fixed in the bays. Their creator was V. Dovbenyuk. The temple was reconstructed in 1835, 1885, 1995 and 2004. It belongs to the Ukrainian Greek-Catholic Church. Address: 22, Metropolitan Andrey Sheptytsky Square.